Flickr/ [email protected]Docker Founder and CTO Solomon Hykes announced his departure from the company on Wednesday. 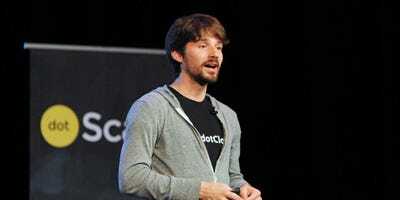 Solomon Hykes, the founder and chief technology officer at Docker, is leaving the company. Hykes is widely credited with developing the core technology behind the $US1.3 billion startup, which makes it faster and easier for developers to deploy code. Hykes emphasised that his departure is not “a dramatic event.” He’ll remain on the board. Docker founder and chief technology officer Solomon Hykes is leaving the $US1.3 billion developer platform startup. In a blog post announcing his departure on Wednesday, Hykes framed his move as a reflection of the company’s evolution as its cloud computing technology becomes an increasingly important business. “To take advantage of this opportunity, we need a CTO by Steve’s side with decades of experience shipping and supporting software for the largest corporations in the world,” Hykes said. referring to CEO Steve Singh. Containers makes it so developers can write a set of code just once, and run it anywhere, on any server or big computing cloud service. This makes it much easier for them to manage all the different moving parts of an app and funnel in their updates quickly and cheaply. “Our premise is that it’s good to develop to target a programmable layer,” Hykes told Business Insider’s Matt Weinberger back in 2016. Hykes’ departure comes almost one year after Ben Golub handed the CEO reins to former SAP and Concur executive Singh. Docker came onto the scene five years ago out of another startup founded by Hykes called Dotcloud. Dotcloud, which Hykes started in 2008 and ran as CEO, didn’t do very well. But its container technology was wildly popular. Ultimately, the team decided to focus on this one product and rebranded as Docker. Hykes will remain on the Docker board and retain significant ownership over the company, though he said he will no longer have any role in the company’s day-to-day operations. “After obsessing for so many years over my own ideas, I am rediscovering the joys of putting myself at the service of others – my friends, my family, and the brilliant entrepreneurs I’ve been lucky enough to advise and invest in over the years,” Hykes wrote. “Over the coming months I plan to use my experience to help them in any way I can.